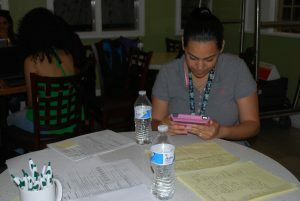 A partnership between grassroots activism group, the Pioneer Valley Project, and UFCW Local 1459, a union that represents workers with regional grocery chain Stop & Shop, yielded potential job opportunities for local Puerto Rican families displaced by Hurricane Maria during a job fair at the Clarion Hotel in West Springfield on June 26. 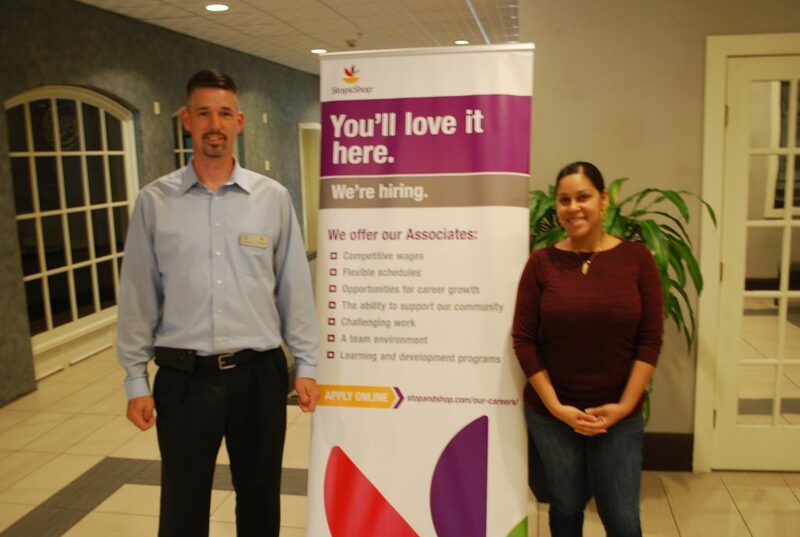 Larry Jones, a human resource business partner with Stop & Shop (left) and Pioneer Valley Project organizer Emily Rodriguez (right) co-hosted a job fair for Puerto Rican families living in the Pioneer Valley. At least 23 people had filled out applications as of the 1 p.m., she said. The job fair took place between 10 a.m. to 3 p.m.
Larry Jones, human resource business partner who covers locations in the Pioneer Valley, said Stop & Shop is hiring for half a dozen stores in Springfield, Holyoke, and West Springfield. There are about 35 to 40 part-time openings for positions such as clerks, deli associates, cashiers, or night crew associates. Rodriguez said there are more than 40 Puerto Rican families living at multiple hotels in West Springfield, including the Clarion Hotel at 1080 Riverdale St. However, many families face an uncertain future in the next week after Federal Emergency Management Agency and Red Cross housing funding ends on June 30 after being extended beyond the initial Feb. 14 deadline several times. “Many of the families here have kids and have some health issues and are unable to work full-time or travel far; they don’t have a car … The issue is that people are still in hotels because landlords are not doing their part to rent. People who have jobs have been trying to get an apartment, but because they don’t have a rental history or a credit history, landlords are not working with them,” she said. Jones said Stop & Shop could hire applicants even if they don’t have permanent housing after June 30. Despite the looming deadline, members of the Pioneer Valley Project continue to reach out to state and federal legislatures to extend the deadline beyond June 30. Dakmary Torres, 31, who has been living at a Comfort Inn Hotel in West Springfield since December after leaving her home in Puerto Rico, said she’s applying for cashier and bagger positions at Stop & Shop. She said she doesn’t plan to go back to Puerto Rico and thinks getting a job is the first step on the path to find permanent housing. Torres said she thinks the United States federal government hasn’t provided Puerto Ricans with enough aid in the aftermath of the hurricanes.